Can We Get a Little Help Here? 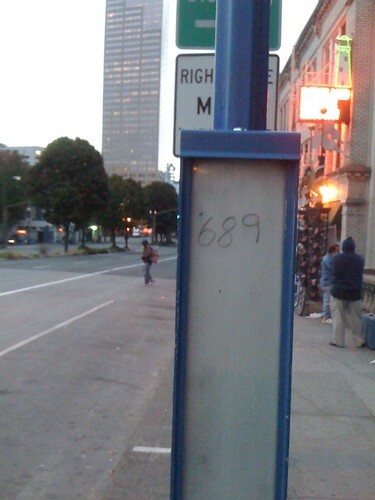 Above are two photos of the little signage frames that TriMet puts on bus stop poles when there is no shelter or other opportunity for larger signage. In the first case, the frame is empty, although someone has helpfully scratched the Transit Tracker ID number onto the glass. In the other, there is an update route description (and stop ID number) but the the glass has grafitti. I’ll bet that neighborhood associations and business associations would help recruit the volunteers. 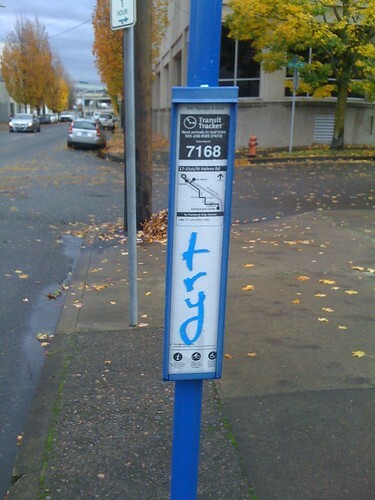 Anyone at TriMet want to run with this? We’ll help promote it here at Portland Transport! Unfortunately it does not appear to be online, but yesterday the O reported that Wilsonville and Clackamas County are insisting on a study for what the connector would do to capacity on I-5, while Washington County wants to move the process forward without such a study. Sara and Elly talk with members of the Bike Temple and Bike Farm, two Portland-based community resource centers on a mission to support your spiritual and earthly bike needs. Time to Reboot the RTP? Do we need to try again on Metro’s Regional Transportation Plan? Mayor Adams has tweeted that the plan fails to meet the goals of the Portland/Multnomah County Climate Action Plan. Members of the Sustainability Commission have expressed concern that the plan not only fails to decrease greenhouse gas emissions, but in fact increases emissions over the no-build scenario. Coalition for a LIvable Future has released a detailed critique (PDF, 324K). Local leaders should insist that our transportation investments decrease greenhouse gases rather than increase them! The folks behind the Walk Score web tool are on the Smart City radio program this week and explain the origins and growth of the tool (real estate sites like Zillow are providing millions of hits).